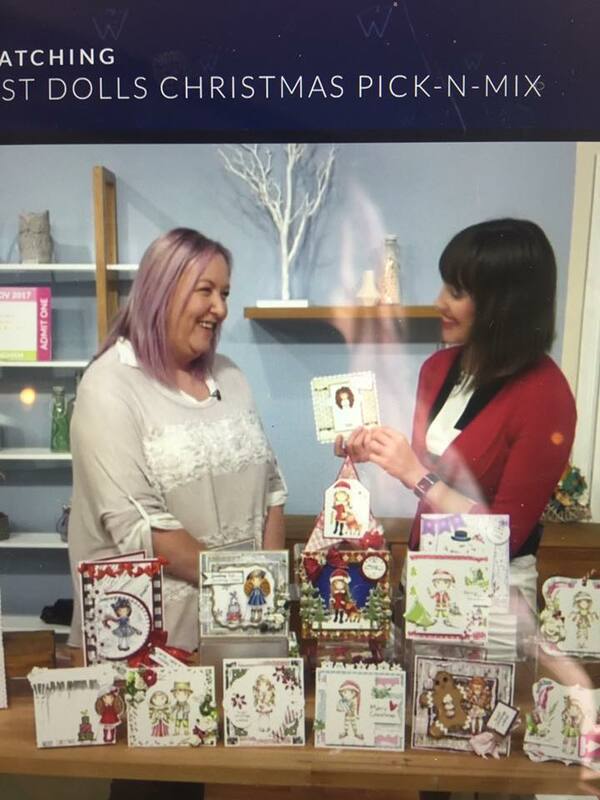 As some of you know I had some of my cards featured on Hochanga TV again. Show went live on Friday 27th at noon. Cards were made with Paper Nest Dolls images and they were all Christmas themed. Here's a pic with Sharon (the presenter) and the TV lady (on the right). You can see quite a few of my cards there. This is a very special occasion and the first of its kind. Swedish House Crafts is proud and excited to team up with Magnolia-Licious just before the scary night falls, BOOO! So, Magnolia Stamps celebrates Halloween by releasing a wonderful first time ever seen collection of fabulous injured and in pain Tildas, lol! But wait, there are medicines and a nurse Tilda too. This is the theme of the 13 Nights Halloween kit 2017. Read more about the event here ... There's a GIVEAWAY!!!! Check it out! For this event I made a card using Early Bird gift - Nurse Tilda. Image was coloured using Distress ink pads. Papers are from Echo park. All medicine dies are from Magnolia, also the "Under the Weather?" sentiment. I added two adorable flowers from I am roses and some laces from my stash. That's it from me today. Don't forget to check the Swedish House Crafts BLOG for a Giveaway!! Today I'm sharing with you some awesome news. 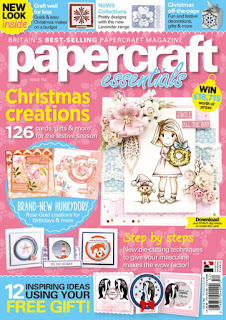 Last week Papercraft Essentials issue 152 magazine came out and my card is on the cover!!! I made two cards for this magazine. One made the cover and the other one made Editor's Favourite! I made these cards using Paper Nest Dolls stamps. Design papers used: Doodlebug - Sugarplums, Doodlebug - Here comes Santa Claus, Simple Stories - Mistletoe Kisses. Design papers used: Doodlebug - Here comes Santa Claus, Simple Stories - Mistletoe Kisses. Today I'm sharing with you a Christmas card made with Stamping Bella image called Merry Everything. I coloured this image using Distress ink pads on Langton 300g HP watercolour paper. 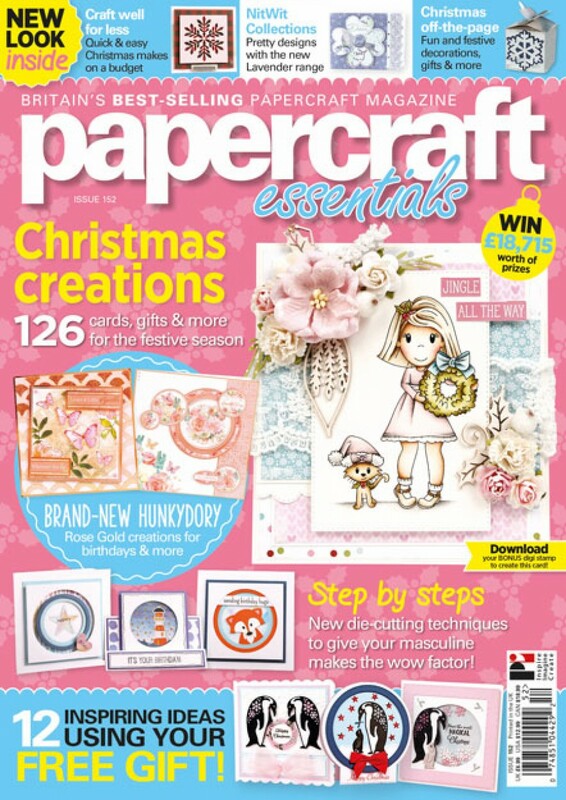 Design papers used are from Doodlebug and Carta Bella. Today I'm sharing with you a Christmas card made with lovely Tilda with Little Rudolf from Magnolia and lots of pretty Magnolia's dies. Flowers are from I am roses, Thailand. Welcome to my la-la land crafts Friday inspirational post. Today I have a CAS (clean and simple) card to show you. I masked together two animals of the Winter Critters set. I used Distress ink pads for colouring. Today I'm showing you a card I made for C.C. Designs Newsletter. I used one of the images from 3 Reindeers rubber stamp set. I cut out the images with Creative Basics Double Stitched Circles Dies. I added a few enamel dots and some stickers from Doodlebug's paper pad. Today I'm sharing with you a card I made for C.C. Designs design team. I made a Christmas card with one of the new images called Christmas Rose. Image was coloured using Distress ink pads. Papers used are from Doodlebug. I added a few stickers and coordinating enamel dots. This image comes as digi or rubber!!!! Today I'm sharing with you a card I made for Swedish House Crafts store design team. I used one of last year's Winter images called Me and My Snowman from Aspen Holidays collection. Marry Christmas stamp in the background is also from Magnolia, it's super old but I love it. Flowers used are from I am roses and Swedish House crafts (Frozen Pomegranate-Glistening White). Hi! Today I'm sharing with you my latest Christmas card made for Swedish House Crafts design team. For this card I coloured gorgeous Christmas Caramel Tilda from A lovely Christmas collection, 2016. Papers used are from Maja Design (Denim & Friends coll.). Flowers used are from I am roses. I added a few Frozen Pomegranate-Glistening White.